James was born in Cleveland Ohio in 1946 and his first experience with boats was on Lake Erie in the 1950’s. After graduating from the Syracuse University School of Art with a degree in Illustration he came to New York and ended up with a career as an Advertising Art Director. 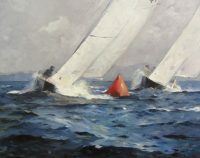 Along the way he joined the Society of Illustrators and the Larchmont Yacht Club where he has been active on the race committee for a number of years. It has been a rich experience for painting. He has also been active in the Air Force Art Program at the Society of Illustrators since the 1980’s and the US Coast Guard Art Program (COGAP) for about 10 years. The rest of his painting is devoted to the sailboats. He summons the moods of nature with his personal narrative of the unassailable dignity of the sea. 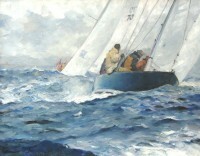 His affectionate regard for the sportsmanship of yachting and racing events coalesces into scenes of startling vivacity. 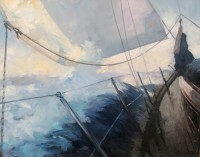 Consor’s skilled interpretation of the sea as a romantic realist follows in the traditions of England’s marine masters, Wylie, Wilkinson and Somerscales, a tradition continued by American artists Fitz Hugh Lane, Frederick Cozzens, and Gordon Grant. 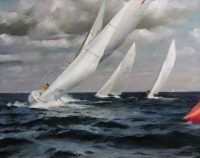 And now, Consor captivates us with his portrayal of America’s racing vessels, calm seas and dramatic skies. The solidity of his form and the accuracy of his drawing, as well as the aesthetic documentation of his rigged masts muted and distilled in a restrained and formal elegance show prominently in his work.